Run-Flat Tyres are becoming increasingly popular as more and more car manufacturers decide to fit them as standard or as an optional extra. 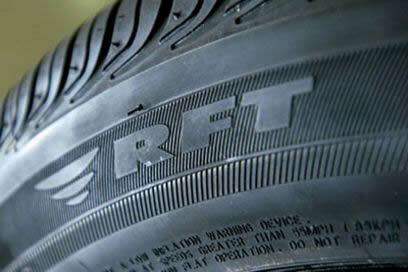 The purpose of a run-flat tyre is to keep the vehicle under control following a loss of air pressure. It also removes the need for a spare wheel. How Run Flat Tyres Work? Run flat tyres have a reinforced sidewall that keeps the tyre beads firmly seated to the wheel rim making them capable of supporting the weight of the vehicle without any air pressure in the tyre. How Fast And How Long Can I Use Them For? Run flat tyres are designed to get the vehicle to a local tyre shop and can be used up to a maximum speed of 55mph and for up to 50 miles. How Do I Know If I Have Run Flat Tyres Fitted? If you look at the side wall markings they will tell you, see below for manufactures markings, you will also have a tyre pressure monitoring systems (TPMS) fitted to let you know if you have a low tyre pressure. Note TPMS can also be fitted to normal tyres. Most tyre shops will not repair a Run Flat Tyre because they cannot tell if the side wall has been damaged and would not want liability problems if the repaired tyre failed.